The Best Horse Racing blogs from thousands of top Horse Racing blogs in our index using search and social metrics. Data will be refreshed once a week. Also check out Top Horse Racing Videos from Best 10 Horse Racing Youtube Channels. 2.3 At The Races - The definitive online destination for horse racing. Horse Racing newsletter is a comprehensive summary of the day's most important blog posts and news articles from the best Horse Racing websites on the web, and delivered to your email inbox each morning. To subscribe, simply provide us with your email address. Lexington, KY About Blog For nearly a century, professionals and racing enthusiasts have relied on The Blood-Horse for accurate and timely racing and breeding news. Each week, Thoroughbred owners, breeders, trainers, and racing fanatics turn to The Blood-Horse for the most comprehensive package of international thoroughbred news and analysis. Facebook fans 127,849. Twitter followers 55,102. Lexington, Kentucky USA About Blog PaulickReport.com covers all horse racing and Thoroughbred industry news, including business, people, racing, bloodstock, breeding, horse care and horseplayers. Facebook fans 25,702. Twitter followers 23,823. 3. At The Races - The definitive online destination for horse racing. UK About Blog At The Races is a dedicated horse racing channel broadcasting daily, live action from the UK and Ireland. Facebook fans 190,780. Twitter followers 184,584. San Francisco, CA About Blog A subreddit for anything related to horse racing in any and all varieties, but not necessarily horse raising & care. Facebook fans 1,081,326. Twitter followers 465,652. New York, NY About Blog Welcome to America's Best Racing, your home for learning all about horse racing! From the parties to the races and beyond, ABR gives you the inside scoop on what you need to know to get started in the world of Thoroughbred racing. Facebook fans 164,491. Twitter followers 37,761. Mountain View, CA About Blog Comprehensive up-to-date coverage for horse racing, aggregated from news sources all over the world by Google News. Facebook fans 21,883,474. Twitter followers 212,815. About Blog Sports data and content provider, specialising in horse racing and greyhound racing. Get Horse Racing Tips and Betting Advice for today - Cheltenham Festival, Grand National & Royal Ascot all covered. Facebook fans 41,063. Twitter followers 24,292. London About Blog Geegeez is the #1 independent UK racing site, with its Gold service offering leading edge form tools, and a proven profitable tipping service. Latest UK horse racing news, racecards, tips and tools. Read our free tips and blog articles. Facebook fans 3,573. Twitter followers 3,198. MediaCityUK, Salford About Blog The home of Horse Racing on BBC Sport online. Includes the latest news stories, results, fixtures, video and audio. Facebook fans 12,516,732. Twitter followers 6,529,912. UK About Blog Get horse racing tips as well as in-depth previews, features and interviews at Coral News. Facebook fans 284,813. Twitter followers 342,646. Bet Now About Blog A blog by Paddy Power! Read our tips and all the news about horse racing and much more! Facebook fans n/a. Twitter followers 643,303. Australia About Blog The latest Horse Racing news, live coverage, video, analysis and opinion, tackling the Melbourne Cup and all the big races around Australia at The Roar. Facebook fans 43,291. Twitter followers 23,526. Australia About Blog Read all the horse racing predictions, sports tips and betting news at the William Hill Blog. Everything the Australian punter needs in one place! Facebook fans 170,965. Twitter followers 29,213. About Blog The horse racing betting tips page shows you how to profit from horse racing free bets and offers using a technique called matched betting. Facebook fans 2,432. Twitter followers 28,245. London About Blog Latest horse racing news, comment, tips, racecards and results from the Guardian. Facebook fans 7,121,650. Twitter followers 6,326,911. UK & Ireland About Blog Join us on the BetBright Horse Racing Blog for all the latest betting news, views, previews and odds for all the major UK and Irish horse racing events. Facebook fans 10,995. Twitter followers 18,857. Australia About Blog Australia's best source of daily Free Horse Racing Tips and Horse Racing News from around the country. Facebook fans 16,009. Twitter followers 13,074. London About Blog The Race Advisor is one of the leading blogs on betting in the UK. Our goal is to help you generate more profit from your betting than you’re currently doing. With thousands of blog posts and some of the leading horse racing analysis software out there, if you’ve got a question about betting then we’re here to make sure you get the right answer. Facebook fans 827. Twitter followers 3,701. Malta | Germany About Blog RaceBets is the world's leading bookmaker when it comes to racing. Owned by German Racing it offers horse racing and ante-post markets from over 40 countries! Facebook fans 705. Twitter followers 12,090. Ontario, Canada About Blog Horse-Canada, the Family Horse Magazine, is an all-breed, multi-discipline magazine with emphasis on equine health, horse care, and rural living and recognizes the inclusion of horses into family life. Facebook fans 304,125. Twitter followers 1,690. Doha, Qatar About Blog Official Video Channel of The Qatar Racing & Equestrian Club. Facebook fans 39,915. Twitter followers 2,566. London, UK About Blog Get the latest horse racing and betting tips on Telegraph Sport. Expert analysis, news, video, form and more. Facebook fans 3,982,491. Twitter followers 2,014,055. Malvar, Batangas, Philippines About Blog We extend to you our invitation to come and visit us at MetroTurf, your best bet in Philippine horseracing. Facebook fans 43,133. Twitter followers 1,323. Ballymany, Curragh About Blog To develop and promote Ireland as a world centre of excellence for horse racing and breeding. Horse Racing Ireland (HRI) is a state sponsored body which was set up in 2001 as the National Authority for horse racing. Facebook fans 55,231. Twitter followers 35,419. Australia About Blog Australia's fastest growing portal on thoroughbred Horse racing in Australia. Comprehensive information on all the major tracks and group one races; as well as fashion, videos and jobs from within the industry. Facebook fans 528. Twitter followers 2,626. Cheshire, UK About Blog We are an online magazine all about the social side of horse racing. We talk about Fashion, Food, Wine and those essential 'things' that you need! Facebook fans 1,322. Twitter followers 8,081. About Blog Horse bettors will find expert online horse racing picks from top rated handicappers as well as information on where to wager on horse races including the Triple Crown. Facebook fans n/a. Twitter followers 9,450. United Kingdom About Blog Betinfo24 Is a free, no nonsense tipping service!! we have been providing winning tips to our members for over 12 years and we have no intentions of stopping. Check out our blog for updates, betting news, and forum. Facebook fans 1,172. Twitter followers 10,042. About Blog LadyAndTheTrack.com is a news site and beginner’s guide to the exciting world of horse racing. Here you can easily read daily updates on everything happening in horse racing to help you become a fearless lady at the track. Facebook fans 5,030. Twitter followers 4,594. Cheltenham, England About Blog Welcome to JPW Horse Racing Tipster. We provide an honest and profitable betting service and have been running since 2009. Providing Daily Horse Racing Tips and regular Content, Podcasts and Free Tips from the industry. Facebook fans 7,179. Twitter followers 13,362. Las Vegas About Blog Get Horse racing news, handicapping and betting tips, picks, and results. Facebook fans 8,419. Twitter followers 3,582. United Kingdom About Blog Welcome to Value Horse Tips, your way to start making money on daily horse racing in the UK.If you want professional, profitable and good value horse tips then we are the service for you. Facebook fans 297. Twitter followers 18,704. About Blog Punting on the horses is one of Australia's greatest passions and our goal is to provide tips, news, free and betting advice for punters. Racetracks everywhere About Blog Past the Wire is the Horse Racing column where Professional Handicapper Jonathan Stettin shares his knowledge, experience and passion for The Sport of Kings. This is where you will find Horse Racing's most interesting and well informed columns, articles and broadcasts on every aspect of the game. Jonathan tackles everything in the sport unbiased, with a unique insight that stems from his vast experience in so many areas of Thoroughbred Racing. Facebook fans 2,543. Twitter followers 3,589. Facebook fans 151. Twitter followers 1,442. World Wide About Blog The world's only feel good horse racing magazine. Four times per year about people, places, horses and events. From all times and places. Facebook fans 199,450. Twitter followers 1,361. About Blog The Racing Biz covers Thoroughbred racing and breeding in the mid-Atlantic region. We cover the sport, business, and personalities of horse racing in Maryland, Pennsylvania, New Jersey, Delaware, Virginia, and West Virginia. Facebook fans 3,968. Twitter followers 3,355. About Blog The Horse Racing Tips Service that puts you in the picture. Finding the right course for a horse is my winning strategy. our mission is to provide our members with the best information available when it comes down to what really counts on the track. By offering professional experience and data, we hope to empower our members to make well informed and educated decisions. New York State About Blog Horseracing Wrongs is an organization working to end horseracing through education and supporting grassroots activism in the United States. Facebook fans 6,315. Twitter followers 1,411. About Blog We are a premium horse racing membership site designed to help you make more informed bets via expert analysis and daily betting tips. Our free blog provides tips and expert information on horses and betting patterns that will help you when choosing which horseraces to bet on. Facebook fans 8. Twitter followers 150. The Lakes About Blog Marten Julian has been involved with horse racing for over forty years and has contributed to numerous specialist publications including the Racing Post. Facebook fans 310. Twitter followers 2,768. About Blog Discussing harness racing from the fan's perspective. Fair Hill Maryland About Blog The National Steeplechase Association is the governing body of jump racing in America. Steeplechasing offers exciting horse racing as it moves from community to community on the East Coast and Midwest from March through November. This racing extends the productive careers of Thoroughbred racehorses, preserves open space, and raises tens of thousands of dollars for worthy charities each year. Facebook fans 1,534. Twitter followers 382. England About Blog A website dedicated to providing horse race tips for National Hunt, All Weather and Flat racing throughout the year. Get free daily Horse Race Tips for the UK . Facebook fans 187. Twitter followers 98. About Blog Horse Racing, Football And Other Sports Tipster Reviews From us And Our Users.Find The Best Tipsters Increase Your Winnings With Free Tips. Facebook fans 233. Twitter followers 17,372. Seoul, South Korea About Blog The Horse Racing in Korea blog covers thoroughbred horse racing on the Korean peninsula. Facebook fans 1,153. Twitter followers 3,281. About Blog British Jump horse racing book. This years edition covers 21 British stables with in-depth coverage of the selected trainers. This easy to read book has the trainer comments on each horse followed by the author giving his thoughts on each individual featured horse. Horses to follow, horse racing tips, betting & horse trainers. Blog by John Morris. Facebook fans 465. Twitter followers 22. Richmond, England About Blog Racehorse trainer based at Green Oaks, Richmond. Proud to be sponsored by TopSpec Feeds. Every winner counts! Facebook fans 2,257. Twitter followers 1,354. Twickenham About Blog Daily horseracing tips and betting advice. Horse racing-loving individual who will one day land that life-changing Cheltenham acca. Saratoga Springs, New York About Blog Commentary on horse racing and politics. Blog by Tom Noonan. About Blog Daily horse racing tips from our premium tipster service offering quality tips from our industry contacts and on course info with a free trial for all new members. About Blog Horse Racing forum offering free contests and picks for horseplayers. Suffolk Downs (Boston) About Blog Jessica Chapel is a digital producer, editor, and horse racing fan. She currently works with the Breeders’ Cup; she previously worked for the Daily Racing Form, Atlantic, American Prospect, and Harvard University. Railbird was the first Thoroughbred racing blog, launching in June 2004 with an interest in all things racing, from horses and handicapping to business and politics. Based in Boston. Facebook fans n/a. Twitter followers 1,640. London About Blog Bringing you news from around the world of racing (from the UK to USA, Ireland to Australia) as well as free tips collated from the web. Facebook fans 317. Twitter followers 2,059. About Blog Get fast horse racing results, exclusive betting tips, racecards for all UK & Irish meets and free bets with myracing.com! Facebook fans 183,207. Twitter followers 206,992. Valley of the Racehorse About Blog As part of the Hills dynasty created by his father Barry, Charlie has spent his entire life immersed in horse racing. Facebook fans n/a. Twitter followers 20,683. New York, NY About Blog Expert Racing Tips. Sky Equine details the best of two-year-old horse racing. Facebook fans 4,917. Twitter followers 9,765. Facebook fans 8,788. Twitter followers 1,267. Scotland About Blog Putting Scottish Sport First With Scottish horse Betting and Scottish Racing Tips. Facebook fans 311. Twitter followers 9,458. Adlestrop Stables About Blog A National Hunt and Flat racehorse trainer, based in the beautiful village of Adlestrop in the Cotswolds. We hope to give you a taste of the excitement and fun of owning a racehorse. Facebook fans 1,201. Twitter followers 5,531.
berkshire About Blog Sports photographer, specialising in Football and Horse Racing and Equestrianism. About Blog Winning racing tips. Daily racing tips. Eric Winner says these are my racing tips. Win at the races. Facebook fans 188. Twitter followers 267. London, England About Blog Blog by Andrew Maynard. Here you will get horse racing tips. Murfreesboro, TN About Blog Danny Brewer's thoroughbred horse racing blog. Thoroughbred polls published by the National Thoroughbred Racing Association. Danny still covers a variety of sporting events throughout the year, but Thoroughbred horse racing holds a special place in the heart of “the Sports Brew”. Facebook fans 95. Twitter followers 88. About Blog The Turk, along with his son, the Little Turk, provide handicapping and bet construction to people who never asked for it. About Blog Join me as I embark on my ludicrous journey, discovering the people and places that make up the racecourses of Great Britain. The challenge is to watch horse racing at each venue in an 80 day period ranging. Fair Hill, Maryland About Blog This Is Horse Racing Original news/feature content about Thoroughbred racing from the team behind The Saratoga Special and more. Facebook fans 8,543. Twitter followers 5,103. Chester About Blog Horse Racing Abroad prides itself as the UK's leading specialist tour operator focusing purely on horse racing holidays. This has resulted in the excellence of the racing tours provided. Facebook fans 94. Twitter followers 2,811. About - At The Races is a dedicated horse racing channel broadcasting daily, live action from the UK and Ireland. Domestic distribution of the TV channel extends to over 12 million UK and Irish homes via digital satellite and cable television. The definitive online destination for horse racing. About - Geegeez is the #1 independent UK racing site, with its Gold service offering leading edge form tools, and a proven profitable tipping service. Latest UK horse racing news, racecards, tips and tools. Read our free tips and blog articles or join Geegeez Gold for premium information. About - George Baker is a Racehorse Trainer at Robins Farm. George has trained nearly 400 winners, including a Royal Ascot winner with Belgian Bill. There have been several pattern successes both here and abroad, and GB Racing horseboxes are often seen on continental motorways. “Have horse, will travel” is very much a mantra for the team. About - We are an online magazine all about the social side of horse racing. We talk about Fashion, Food, Wine and those essential 'things' that you need. 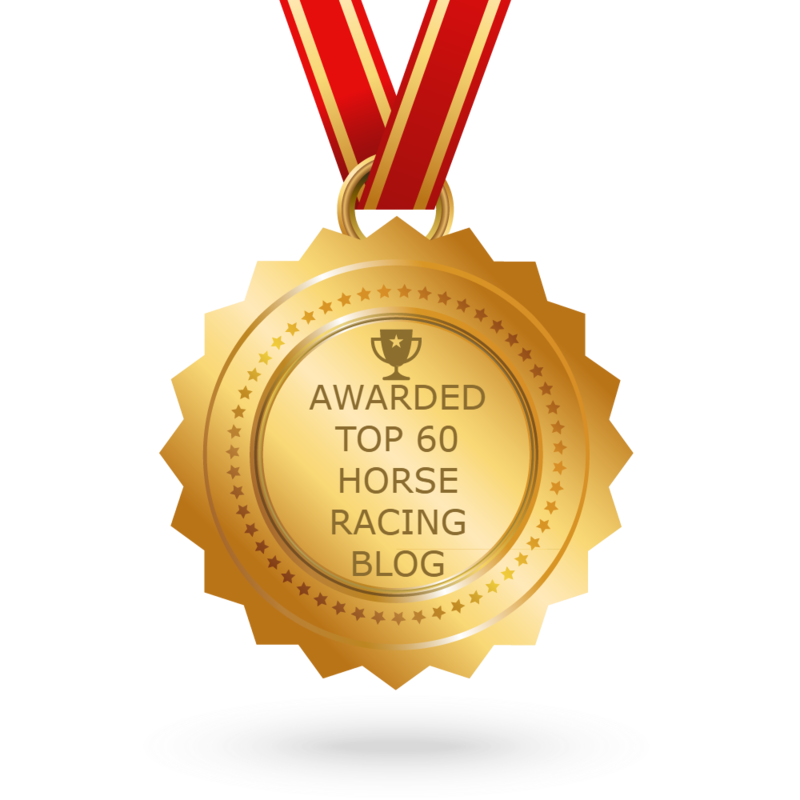 CONGRATULATIONS to every blogger that has made this Top Horse Racing blogs list! This is the most comprehensive list of best Horse Racing blogs on the internet and I’m honoured to have you as part of this! I personally give you a high-five and want to thank you for your contribution to this world.